Register online through April 17th. Register by mail (.pdf) by April 14th. Register race day before 7:15am for the 1 mile and before 8:15am for the 5K. Please support Dodge County Hospital in conjunction with the Oconee District Attorney's Office in our 5K and 1 Mile Fun Run/Walk. 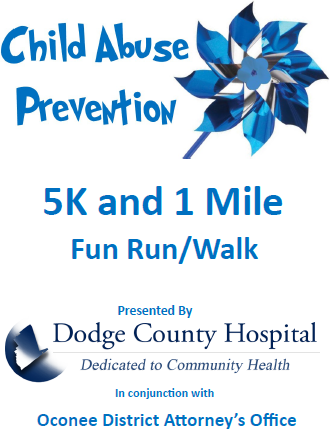 ALL proceeds go into child abuse prevention materials and the race; no one profits from the race. Runners, walkers, strollers are all welcome! Overall male and female winner. Race packets and bibs may be picked up the afternoon of April 19th from 4-6pm at First Baptist Church. For more information, please contact Sandra Campbell at 478-231-6968 or Miranda Bush at 478-231-5058.